News > Up to Date > Interview: "We are proud of the large number of honours"
A jury of German scientists, industry experts and specialist journalists recently awarded dental instrument manufacturer Dr. Walser Dental for its ON-matrix. Dental Tribune Online spoke with CEO Gerhard R. Daiger about the product, which was named "Best of" in the medical engineering category of the 2017 national INDUSTRIEPREIS award and about the many other recognitions the company has received in its almost 70-year history. Mr Daiger, what is the ON-matrix, and which are the unique features of this product that may have impressed the expert jury? The handmade and reusable Walser tooth matrix adapts automatically and tightly to the tooth and its natural anatomical shape. In the case of caries at the most posterior tooth, the dentist generally uses conventional matrix systems with screws and retainers. To attach these systems, often three hands are necessary, so the procedure is uncomfortable for the patient and for the dentist. Furthermore, in the distal area at the most posterior tooth, there is no possibility of using a wedge, which results in a surplus of filling material that has to be removed with great effort afterwards. Unlike conventional matrix systems, the Walser ON-shape adapts automatically cervically without a wedge, also at the distal aspect, with only one hand movement and within seconds. Gingival bleeding rarely occurs and the matrix acts as a cotton roll holder at the same time. All Walser matrices can be used with rubber dams; the ON-shape can even be applied above the rubber dam clamp. The INDUSTRIEPREIS panel evaluates the submitted products and solutions based on specified criteria, among them overall progress—innovation, readiness for production and future orientation—as well as economic, social, ecological and technological benefits. 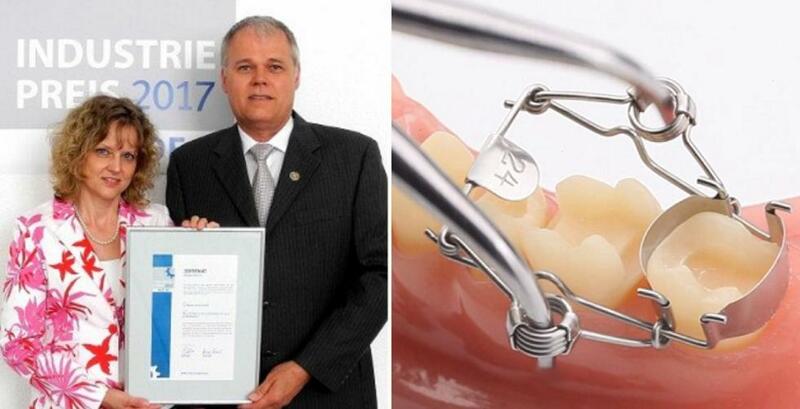 The ON-shape Walser matrix convinced the expert jury, composed of 34 academics, scientists, industry representatives and specialist journalists, especially because of its time- and cost-savings for the dentist, the advantages for the patient and its ecological advantages: the matrix can be reused and sterilised numerous times and never lose its constantly high spring force. Already one day before the opening of this year’s International Dental Show, Dr. Walser Dental’s innovation had created a press hype. Thirty journalists visited the booth to learn more about the product, and two television teams came by to capture the Walser tooth matrix in detail. Your company has been awarded before. What recognitions have you received? Dr. Walser Dental was established in 1948 and today we have clients in more than 100 countries all over the world. We are proud of the large number of honours that our company, our social responsibility and the numerous innovations regarding Walser matrices and other products have received over the years. We have been honoured with over 50 recognitions. Already in 2006, Dr. Walser Dental received the TOP 100 prize, an award that honours the most innovative of Germany’s small and medium-sized enterprises. We were even the first company in our area of the medical industry to reach the Top 10. In 2007, we were honoured among the Top 100 again. Only one year later, we were part of the Top 3 of the International Best Factory Award, which is a benchmarking project in Great Britain, Italy and Germany. In 2016, we were honoured with the Grosse Preis des Mittelstandes for the ninth time. According to a benchmark survey, this prize for medium-sized enterprises is the most important business award in Germany. Our company takes a strong stand for social responsibility too, and our efforts in this regard were rewarded with the Mittelstandspreis für soziale Verantwortung in Baden-Württemberg for the tenth time in 2016. In 2013, Dr. Walser Dental was even among the Top 5 for this award for social responsibility of medium-sized businesses. For our tooth matrices, which are still manufactured by hand in Germany in-house, we have annually received the “Best of” INDUSTRIEPREIS and this year marks the sixth time. In 2008, the product was listed among the Top 100 in the US by Dentistry Today, and in 2013, received the INDUSTRIEPREIS in the category of medical engineering. To launch innovative and successful products, manufacturers constantly need to invest in their business. How do you drive your research and development? The unique modern system of Walser tooth matrices is the outcome of scientific research and practical experience and the continued development of a wide variety of shapes and sizes over the last several decades. In our factory, we have gained a great deal of experience. Furthermore, we have always worked closely with users, dentists, research institutions and universities, and the innovative process and success of our matrices are outcomes of this cooperation. The success of this process is evident in the increasing number of dental traders all over the world, who use our matrices as a door-opener product when they visit dental clinics. We are continually working on innovations that offer advantages for both the dentist and the patient. Besides these product-related innovations, we concentrate on process-related innovations with the aim of securing the production of our handmade tooth matrices in-house in Germany and in this manner ensuring jobs remain in Germany.